SINGAPORE - She worked three jobs to pay off her husband's gambling debts, only to have him leave to be with another woman 15 years ago. It was a tough time in Madam Ling Bee Sian's life, but she focused all her energy on work and supporting her two children, then aged 17 and 20 respectively. 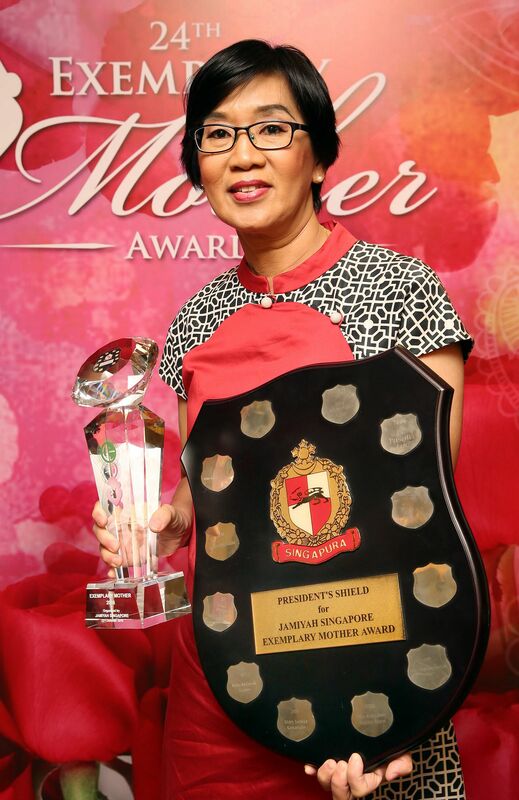 Madam Ling, now 63 and director of nursing at a nursing home, was the winner of this year's Exemplary Mother Award, which was presented at Mandarin Orchard Hotel on Saturday (Oct 22). The annual award, first given out in 1993 by Jamiyah Singapore, honours mothers who contribute to society while raising their families in the face of difficulties. Some 65 mothers were nominated this year. Saturday's ceremony included a charity fashion show featuring the works of three Singaporean fashion designers as well as a Batik artist. For Madam Ling, the most challenging period was when she and her ex-husband were deciding if they should separate, figuring out how to handle their assets, and who should take care of the children. "For me, money can be earned any time but I can't do that with my children. Once we separated, I never ever thought of remarrying again," she said. Instead, she invested all her efforts in her son and daughter, whom she considers her greatest motivation. At one point, she fell from a two-storey-high flight of stairs during a period of depression, causing nerve damage to the left side of her face. But she knew she had to stay strong for her family. "My children are my precious diamonds. I'd give up my money and whatever assets I have, but I want (them)," she added. She now has four grandchildren, aged between 22 months and 10 years. Her daughter, 35, is an occupational therapist and her son, 32, who is also in healthcare, is an operation executive. "We cried together, but we enjoy life together now, because we see the fruit (of our struggles)," she said. "I've never felt that difficult times are the worst times. I feel that they are the best time for children to learn," she said. "Most importantly, it's about how you are going to overcome this challenge (before you). Once you do, it will make the family stronger." Among the five finalists was also teacher Dr Alimah Lob, who received her doctorate at the age of 65 after getting her Bachelor's degree 10 years before that. Image consultant Madam Betty Yu, 54, who took courses to run a home business to support the family after her husband was paralysed from the neck down after a car accident in 2005, was another finalist. Also recognised were Madam Norhaiyati Yusop, 53, a senior secretary, and Madam Tan Siew Suan, 61, who is self-employed.